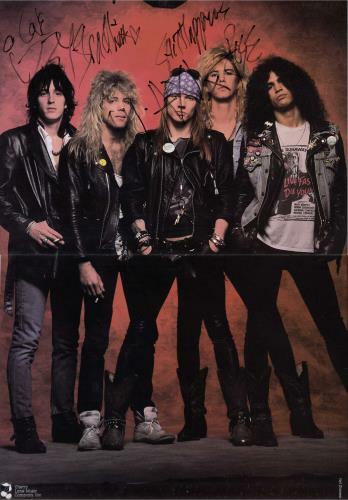 GUNS N ROSES In Person (Rare Autographed 1989 US A4 size illustrated 32 page softback book, featuring complete lyrics to all songs from Appetite For Destruction and G N'R Lies, plus an interview with Axl originally published in 'RIP' magazine, an article on the band from 'Guitar For The Practicing Musician' magazine and a full colour fold-out poster on the inside back cover. This example has a sticker on the front stating 'Cherry Lane 12.7.89. 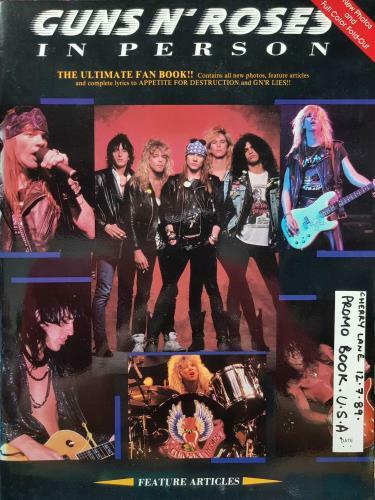 Promo Book U.S.A.', whilst the poster still attached at the back has been signed by Izzy, Axl, Duff and Slash in a black pen, Slash in a ballpoint pen at the bottom).